Dos Libras came with an extensive library of documentation about her systems. There are original brochures and receipts of every kind. 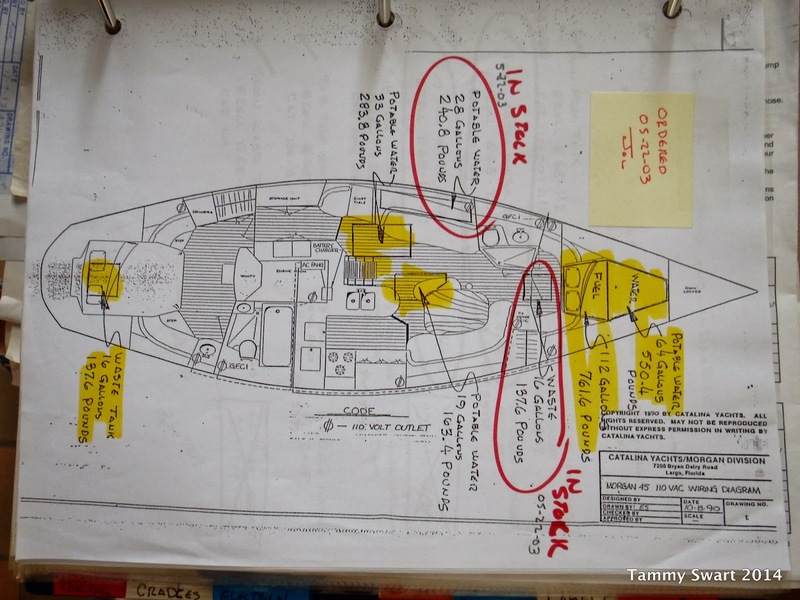 The schematics of the boat are here, but we've found that there have been many changes over the years, so they are not always accurate. 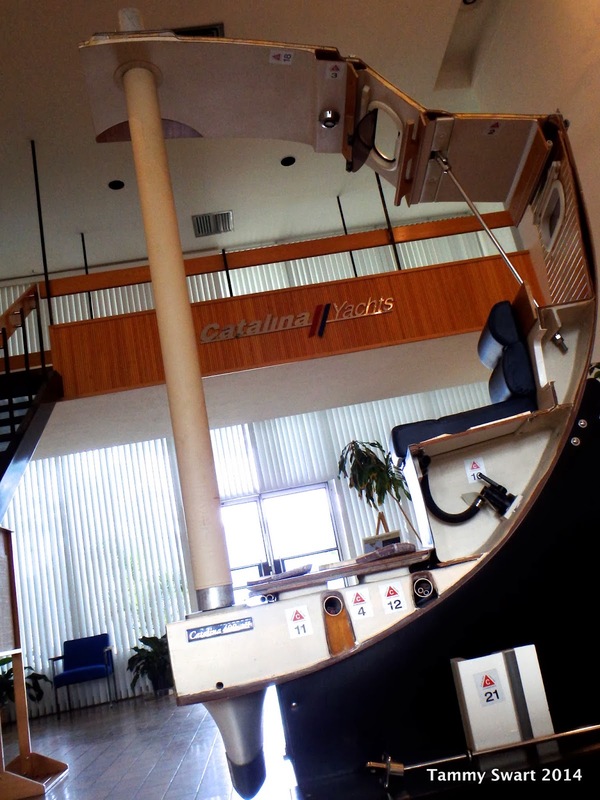 When we realized that our boat was actually built in Largo, Fl.... right where we're staying while we wait for our yard work to be done... we decided that a trip to the Catalina Yachts manufacturing site was a good way to spend a day. We were looking for the schematics for OUR boat, hoping that maybe she was a custom order and not just full of after-factory changes. Most evident of which are the position of our water tanks. The plans for our actual boat were sadly, stored off-site, but we were able to take a look at some like it built around the same time. Unfortunately, we came up with the truth of our situation... our tanks had been replaced. Warren, our host, told us that they had never used aluminum tanks and that's what we have. Ours are also placed very differently from how the specs indicate... I hope this is a good thing? We returned to the facility after a nice lunch and a quick trip to get some measurements from the boat, to take a factory tour. Luck would have it that this is the one day of the week when they are offered! 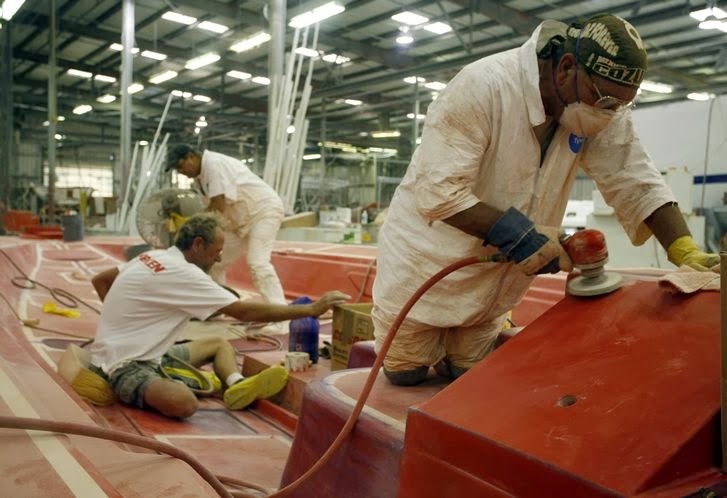 The plant closes down and sends the workers home early so that curious boat owners can take a stroll through the grounds and see how their babies were made. They actually have only one mold for each hull type, not all of which are still in production. The molds look like huge bananas made of pipe, with a big swimming pool inside. The top of the swimming pool is prepared for gelcoat by being meticulously cleaned and taped off. They spray the non-skid first, then re-tape it and do the gelcoat in layers. They add a layer of barrier coat inside the gelcoat now, where as it was applied to the outside back when our boat was built. This layer helps keep down the blisters on your bottom. 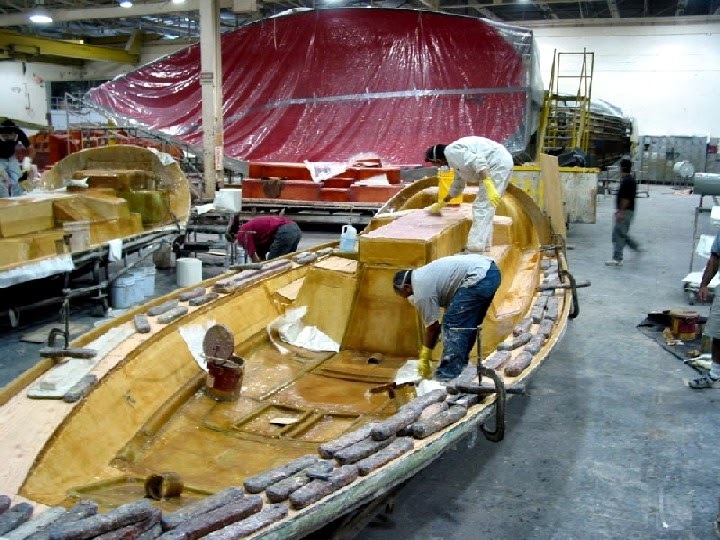 Once the hull is completed after layers and layers of hand laid fiberglass, (we saw several boats in various stages of this), they lay the deck core. It is made of compartmented sections of balsa wood with epoxy for strength. The next step is a grid liner. This is also made of fiberglass and is sort of a honeycomb structure that is joined to the hull for strength and support. After seeing this, I have a LOT more confidence in our boat. Some of the wiring conduits are installed inside this layer. Next, they put in the hull liner, which is also made there of hand laid fiberglass out of molds made in much the same way as the other two structures. This is the glossy inside you see and it kind of looked like an empty Barbie House. It has all of the structure for cabinets and seating for the finished product, but without the wood. The wiring and plumbing are all installed and then the interior is finished. We saw the woodworking rooms where they make the doors and trim, all from teak. They make the floors and wall coverings there as well. We didn't get to see it all, but Warren told us that they were making the door slats like on our boat inside that room. Can you believe that he KNEW our model had the door slats??? He knew our boat like it was his own... from 20 years ago! I was impressed! We climbed the stairs to peer down inside a couple of boats that were in the final stages before the deck is place on top. 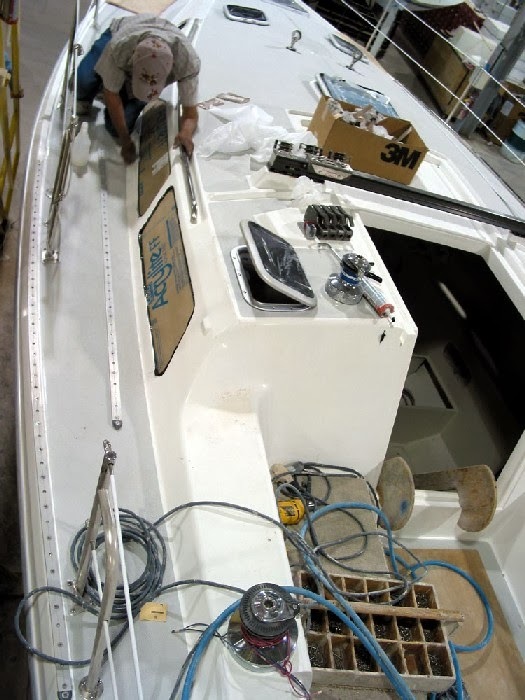 Then we moved on to those who were in the deck hardware stage... it was cool to see where the cleats and stanchions and winches were all placed where they had ample unseen backing structure built into the hull in the earlier stages. We moved on to the keel phase where we saw a whole bunch of lead keels just waiting to be installed. 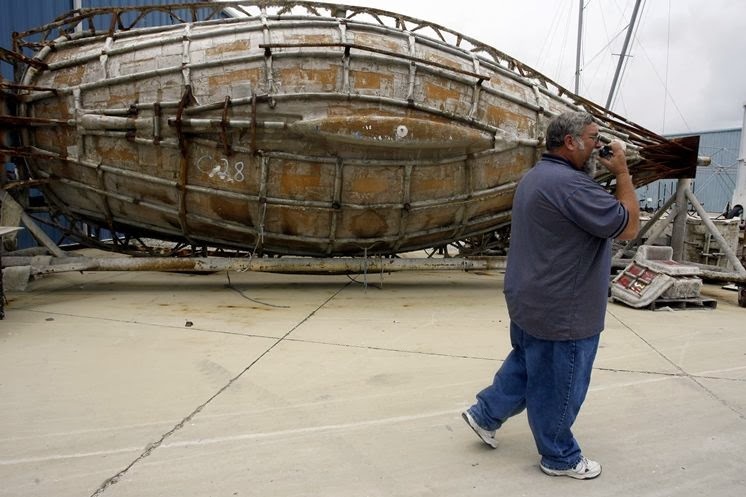 The boats are held by curved cradles until their keels and rudders are installed, near the end. Then they are floated in a long pool where all of their systems are in-water-tested. It was pretty cool to see how it all came together... I wondered if they ever were like "oops! I forgot to install the whatsis before we put the whoosit on...My bad!" It all seems like such a lot of stuff to remember! We were both very impressed by the attention to detail and proud that our boat was made in such a solid way. Of course we are somewhat biased you understand. We feel like we know our boat a little better than before, even if there have been some modifications made... If you EVER find yourself in a position to take a tour of your boat's (or any other boat for that matter) birthplace.... DO IT! It takes some of the mystery out of it and inspires confidence like nothing else can. That's very curious. They said they used the plastic like tank (I've forgotten what he called it). We saw a lot of them laying around and even some of the bag type. Maybe the guy was mistaken, but he said that there are a lot of tanks out there that look like they were factory installed but are not. Was Magnolia built in Largo as well? Weird that they say no aluminum tanks after I just cut a 135 gallon ALUMINUM tank out of the v-berth. Can't imagine that tank not being original equipment, else someone cut a large hole in the deck to get it in there. All my drawings I have on the M44 show aluminum. LOL you could be right in that unobtainium thing! He sure seemed certain of it! I couldn't imagine our tanks not being original either as they are under the cabin liner. No sign of being cut here either. Well, maybe we've been mislead a little. Oh, and BTW, I think the stock v-berth tank for M44 on the specs we saw was like 63 or 65 gallons. Maybe your tank wasn't original after all.